If you’re wondering where to start when it comes to selling all your stuff, then start with one of our clever and witty minimalist books. Each of our minimalist books outline steps you can take to help you Sell All Your Stuff…and do more stuff with less stuff. Added Bonus – they have zero trans fats! It’s a buck. It teaches you everything you need to know to pull off a successful yard sale. It’s 15 pages. It can be read in your bathroom in 5 poops or less. And It’s a buck. 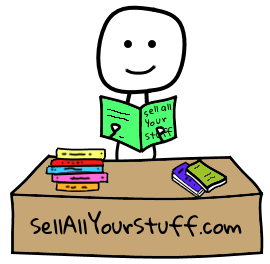 If you’re retiring, moving, or just want to take it easy, snag the first ever book from Sell All Your Stuff. The 2nd of our minimalist books. We became house sitters by accident. Now we’re like the Tom Jones of House Sitting (minus the underwear-tossing ladies). Need some budget travel tips? Want to find out how you can easily fund a vacation, or even find free ways to travel? This is the one for you! Not sure where to start decluttering your closet, cabinets, cranium, or calendar? This fun read will guide you every step of the way! And if these minimalist books don’t grab your attention and you’re looking for some free stuff, just sign up for our monthly newsletter and free stuff ye shall receive, matey. I don’t know why I wrote that in pirate tense, sometimes it’s just fun to sound like a pirate. Yarrr.